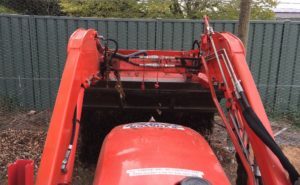 With Lorraine opening the gates at 7.30 am the 3rd of our four deep hollow-tyne verti-draining works were underway. 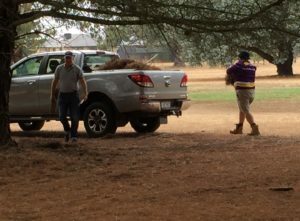 The front end loader arrived from Kyneton just after 8.00 am and the top-dresser was off to follow the coring machine and the core picker-up to sand the greens. 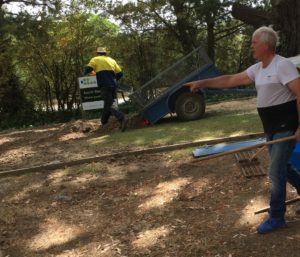 Members began arriving just after 8.00 am and work on a number of projects started. 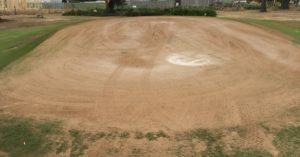 Freebie ran the top dresser for the first eight greens, thanks. 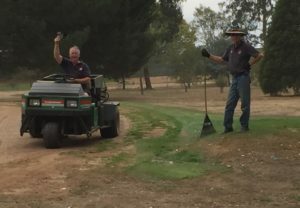 Smudging in the sand on the greens – Bruce, Ron and John F. This had to done both before and after the greens were seeded and fertilised. Ron and John always happy in the service. 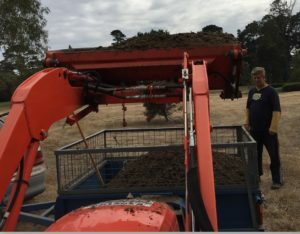 Seeding and fertilising the greens – Twig and Hugh. The boys were just too quick to catch on camera. 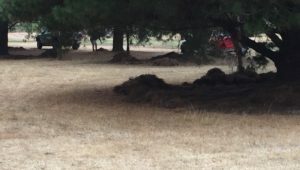 Wendy and Jenny working between the 4th and 5th fairways..
Piles of pine needles ready to be picked up and carted away. Darlene and Roger fill up another load. 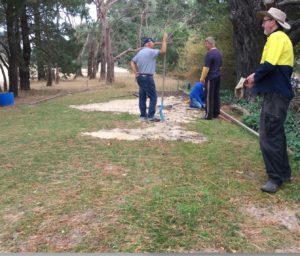 Raising and levelling the men’s 3rd tee – Kev, Scotty, Chris with some late assistance from Mick Snr. The wooden edges are in and levelling begins. Loading cores to raise the tee. Unloading cores to level the tee. Just about finished, well done one and all. 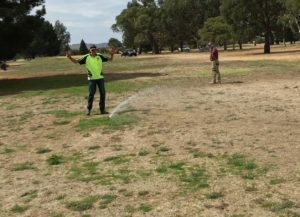 Checking the fairway sprinklers – Twig and Hugh. All sprinklers checked to ensure correct spray distance and fall. Some had to be adjusted at the sprinkler or in the valve box. Well, the 2nd fairway is OK, now on to the rest. New tee between the 8th tee and the 16th green. A bit of invention always helps out with these sticky jobs. Keeping the troops well fed and watered. – Elaine did her usual wonderful job here. Much appreciated. Romsey Golf Club (RGC) golf course has been at Romsey Park since 1921. 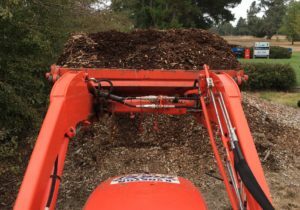 We care for and improve the ~75% of Romsey Park that is the Course. Currently we have twelve greens and 18 tees. The course rating is men - Par 72 Slope 124 and Women - Par 73, Slope 119. 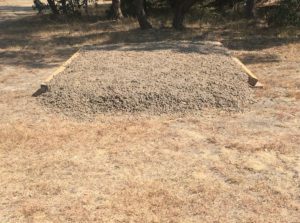 Indigenous native trees and bushes are planted to make the park/course more attractive to golfers, community members and native insects, birds, reptiles and small mammals, to provide shade and wind control and for carbon abatement. 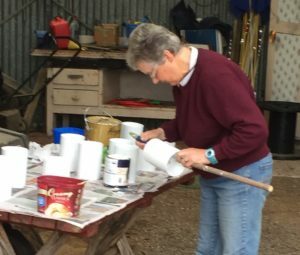 RGC is a totally volunteer run club. We hold Women's & Men's competitions on Wednesdays (9.00 am for 9.30 am hit-off) and Men's & Women's competitions on Saturdays (11.30 am for 12.00 pm hit-off). 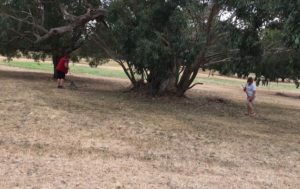 Twilight golf runs every Friday (4.30 pm on) between November and February ($5.00 for golf and $5.00 for a light meal). 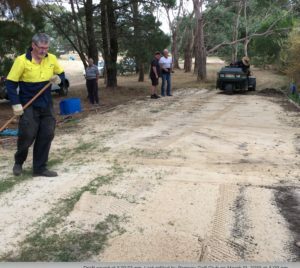 Wednesday April 17th – Ambrose – Lancefield G. C.
Romsey Golf Club General Committee meetings, 2nd Wednesday of each month.